Source: StornArt.com (Creative Commons Attribution-NonCommercial-ShareAlike 2.5 License). While Yamabushi Kaidan was the obvious choice to kick off these profiles, I’ll mix things up a bit … the first of the nine heroes from Circle of Tears who I will profile is Akio. Akio is a young Shugendo priest (a shugenja) that serves the village of Kyuusai. Kyuusai is the only settlment in the remote Autumn Valley, which is encircled by impassable mountains. Kyuusai lies at the foot of the majestic Autumn Mountain, the dominant feature of the landscape that gives the valley its name. Akio studies under Yamabushi Kaidan whenever Kaidan descends from his meditations atop the Autumn Mountain. Given Akio’s enthusiasm for Kaidan’s bushcraft, Akio could be loosely described as Kaidan’s apprentice. However, in the world of Circle of Tears, yamabushi and shugenja follow different callings. Shugenja are the urban-based cousins of the hermet-like yamabushi. As a novice shugenja, Akio tends to the village’s spiritual needs. Like Yamabushi Kaidan, Akio channels magic through Mikkyo chants and rituals … primarily drawing on the elements: wind, water, earth, fire, and void/spirit. Akio has a natural aptitude for healing, and while at the beginning of the novel he relies on natural remedies such as herbs, as the story progresses, he develops magical mantras that heal the body and soul. Akio’s journey through Circle of Tears is one of the most challenging. As a studious and reserved character, Akio is forced to find inner strength as war threatens everything he loves. If you have read The Smoke Dragon and The Mist Ninja, you will know that Akio stands up against bandits and ninja … with consequences. As you will read in The Mist Ninja, Akio’s friendship with Yumi deepens into love. The dynamic between Akio and Yumi drives much of the story, and it creates tensions with other characters – especially Kaidan. 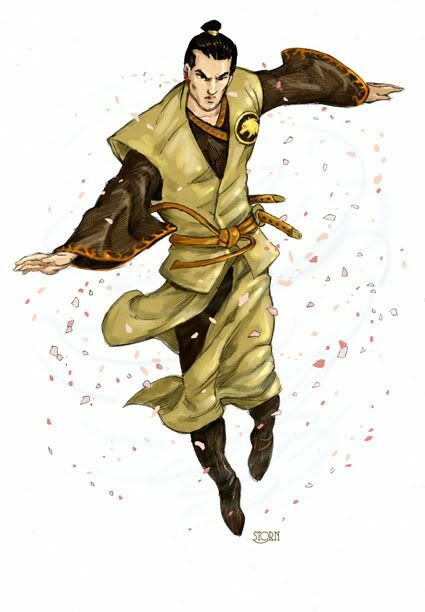 Akio is one of the three principal protagonists (along with Kaidan and Yumi) and a founding member of Kaidan’s nine heroes, along with Tsubasa and Yamabushi Kaidan himself.